The artist Valeriy Morugin evokes high spiritual demand for self comprehension, understanding of one’s destiny and of reaching perfection during the transitional period. Like a call for battle already foreboded. And the horses, set in stirrup. The way that has been passed is appraised from above. The paintings of V. Morugin have been taken out to France, Germany, Poland, Great Britain, Romania, Holland, Hungary, Japan, USA, Senegal, Italy, Iraq. He is also known in Ukraine. But he is not known in the heart of Russia – in Siberia. Besides, most of his works we’ll see only on amateur photographs and not of the best quality. The artist’s workshop is in the South of Ukraine – Malorossia. There gather together the searching people in the small exhibition hall. For many of them V. Morugin presents a spiritual preceptor through his works. All the guests visiting the city of Kherson aspire to visit the artist’s workshop. Among them are the pastors from Europe, eagerly buying the pictures. On the cover page of the almanac and on the first page of the site you’ll also see the picture of V. Morugin “The Mother of the World”. This picture has been literally begged out by the people living in Germany. Having brought the picture home, they’ve hanged it opposite to the crucifixion cross – the cross has fallen. The nail was reinforced and the cross brought back to its place… but all over sudden it fell again taking out a good portion of the construction material with it. After the cross has been relocated and there occurred no energy corridor, everything calmed down. The crucifixion cross is a serious separate theme of human misleading. These are indeed the very remarkable qualities which V. Morugins paintings possess – the indicators of purity. Do we always think about what we hang on walls, put on the shelves? Who happens to be the author of these works? What state was he in when he created that? And even more, what is his inner state at present? Did he bring in any distortions of his world view in his own work? All these questions will be answered by us in the process of narration. And most important, when we buy and bring to our home, what later on turns out to be destruction, we shouldn’t blame the author for his distortion, but try to locate that “glue”, that inner dirt, which lead us to this work and praise the Creator, if the distortions are found even with passage of time – this means that we grow! The first meeting with the person, artist Valeriy Morugin took place in august 2004. He called me and we have arranged a meeting in his workshop. Having found out that I conduct research in the field of human aura, there arrived the proposal to confide. So there I stand in the exhibition hall with the set of books of “The Fire of the Unified Cosmos”, eventually they have been left with Morugin and the people of Kherson take the books for reading as if from the library. Having viewed the works I understand, that I have seen all this, I understand everything! In the hall there gathered together 60 people, it is surprisingly many for a city like that. There were all kinds of people: the anastasians, worried about one hectare of land, adherents of Marchenko, followers of Rerikh pompously important with a grimace of skepticism, all kinds of magicians and fortune tellers, exalted fans of Duskova. For the sake of truce, all listened attentively – one could hear a fly passing by, such was the silence during the pauses. In couple of months Valeriy Mikhailovitch will refuse them to attend the exhibition hall and will plunge into a long period of searching and analysis. However, the persistent fans will remind of themselves by… mourning wreaths brought into the workshop. They would try to break him down with phone calls suggesting selling all remaining pictures at any price, only that nobody could see them ever again. Or a visitor who only recently begged to sell a work and was turned down – suddenly vanishes in thin air. There he was and now he isn’t, but the corridor is long and is viewed very well. A familiar hand isn’t it? Let’s return to the hall in august of 2004. I have shared the materials worked out by the center, accompanying the pictures of Marugin with comments from the books of “Fire of the Unified Cosmos” during the discussion. The picture is especially painted for a woman who brings up two boys all by herself. This is the picture which gives support. This is the picture which gives understanding, that the mother can give strength and bring boys up in a right way alone, one needs only knowledge. It is this very energy that streams from the picture. The picture is painted in rose-blue color range. Morugin takes on brush namely that color and in that succession, which appear in people’s auras. 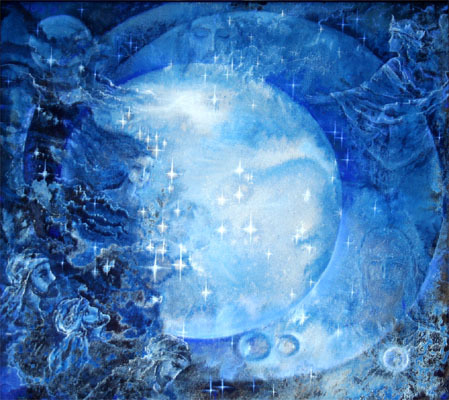 By looking at his work one can study the changes in the energy potential of the planetary and human aura. The picture will not find response with the person, who is not ready to accept what is happening. One of these persons was a woman, who claimed that Vasiliev is haughty, and Rerikh tried to combine none combinable colors. Morugin paints with breach of every rule for color, there can be no rose combined with blue. This was said by the person who has been teaching for 30 years at the Art’s Academy! “He can’t, he mustn’t, not right” – say those, who must adjoin the man to the understanding of the World by means of color. When you tell such people that the genuine artist draws inspiration from the World of Spirit – you’ll see glassy, bulged eyes. Such people do not understand that Genuine Creation doesn’t stem from frames and limitation. Many artists spill out their inner search, contradictions and their seeking on the canvas. In this Respect, Morugin is very refined and delicate, he pains over in solitude not making the spectator a witness. He dies and is born again – silently, without complaints. And he acquaints us with the newborn through the picture. He himself looks at the result of the pains and grasps his own depths through what has been spilled out, elevating the spectator up to his own level. As a personality Valeriy Mikhailovitch possesses a wonderful quality of not interfering in other people’s space – state. While near him, one might forget about him, loose him, there is such an impression that he doesn’t even breath. 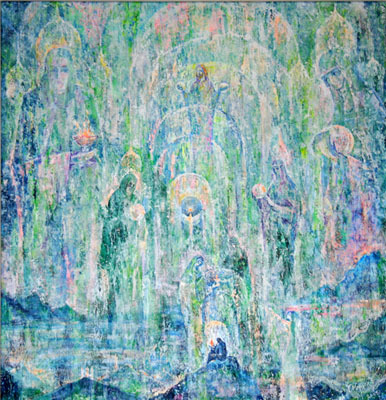 Morugin paints in an altered state and often together with spectator he tries to penetrate his painting. The artist possesses a delicate range of color and a special painting technique, one can say author’s technique. Almost all works are nameless, the names are given by the spectators unanimously later on. Energy sounds, one must learn to hear it. Some of the works the author keeps to himself as a source of inspiration, trying to “go” deeper inside the picture. In 2006 such picture has been “The Source”. The painting left no one indifferent. Some got scared, some got inspired. During the Odessa exhibition one man exclaimed: “This picture engulfs me!” The spot in the center of the picture rotated, turning into a clot, which then left the picture and started to move about the hall. 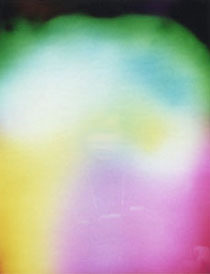 To the opposite hanged the picture called “The Aura” which created the energy corridor that people could actually feel. The clot hung over some people’s heads and one could see the shinning auras. If someone would hang another painting of the same author opposite to this one, there would be energy of another nature, of another quality and properties and even the feelings of the people would be different. Thus appears the experience of importance of being not only in the same premises, but especially in front of the pictures of different authors, because it is always energy. In this case one work intensifies the other, showing new qualities. By the way, the pictures can have sympathies (identity of energies) and antipathies, in that case the force of the picture will be spend in struggling. This can even be felt by the author, who can be any distance from the painting. The connection between the author and his child – is OBVIOUS. In the space where paintings or reproductions of Rerikh, Morugin and Vasiliev are located there is no antagonism, no struggle. There a special flickering wave is created and its name is – Learning through touch. 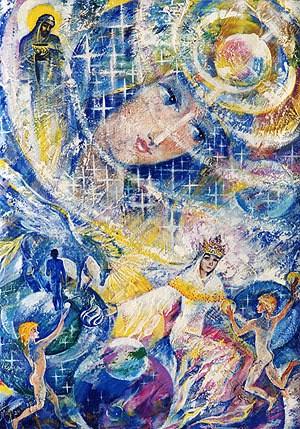 In 2005 three original paintings of artist Valeriy Morugin were brought to Tuomen: “Magnets of Mother Earth”, “12 Gates” and “Jesus”. Many residents of Tuomen saw these works as distinctive due to very harmonic, pure and rich combination of color. Year has passed. 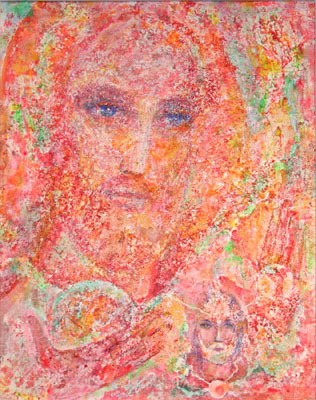 The picture “Jesus” from the triptych has drastically changed its color, two other works were claimed in Odessa. Unfortunately after a year I haven’t seen the works belonging to Odessites, but there is the experience in Tuomen. From tender rose-orange radiance, it became dirty orange-red. Morugin doesn’t employ such color range. The located works have changed their color towards original after being exhibited. V. Morugin “Jesus”. V.Morugin “Magnets of Mother Earth”. The work “Magnets of Mother Earth” – has faded, as if someone has decreased the voltage in the circuit and there appeared an angle of light, i.e. the light didn’t stream at the right angle, but was turned to the far right corner. The woman who owns the picture was very attentive. She told that flashes of poisonous-red shade “wandered” along the dark-blue frame, and opposite to it hung the work of another author. The call to Morugin confirmed that he was feeling uneasy and was experiencing attacks. It is very important to understand that the energy struggle taking place in our living space can’t avoid telling upon the aura of the residents and their health. This very work shined of silver, responding to and reinforcing the feeling of harmony and happiness, if one approached it in this very state, however just as the struggle has ended, i.e. the work of another artist has been removed. And on the contrary, if the condition of the person who has approached the picture is heavy and depressive, due to the inner struggle – the picture immediately created some sort of field, ranging to 70-80 cm. It would be impossible to reach closer, one could distinctly feel the bouncing space. The paintings are alive and like people they need the environment to restore themselves. This environment is created and elaborated on, getting its strength from meeting to meeting at the exhibitions. One can not just view the paintings filled with light, but also note his own changes, especially if one is to make aura photos before and after the exhibition. And the third work – “12 Gates”, the same thing happened there as with the picture “Jesus”, the shinning and all shades of rose vanished. In both cases there occurred discord and a lasting no acceptance of each other in the family. The color range of rose – means Unconditional Love and all the disputes of those living close will affect the painting, which absorbs the dirt of human relations like a sponge, but looks like the picture’s strength has its limits, that’s why the color has gone worse. The color can change or disappear completely. 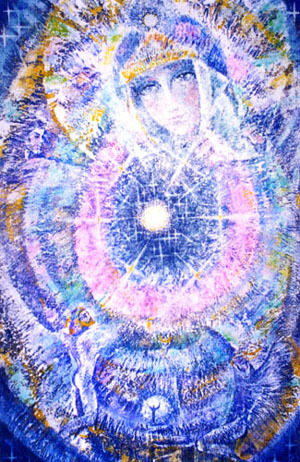 It is the picture “12 Gates”, painted in 2005 that precisely repeats the colors which have been composed in the building up auras of people responding to the streaming energies through the Maternal Magnet. 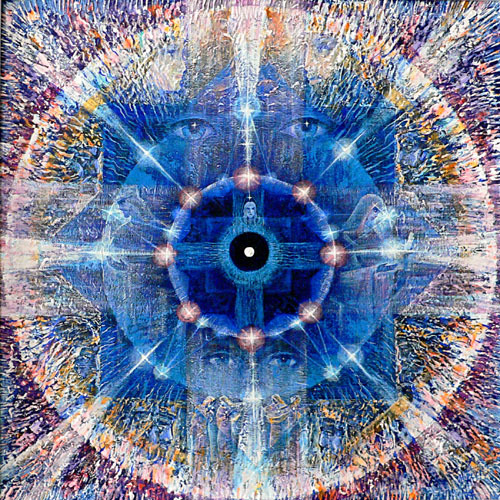 12 Gates – 12 Rays – 12 Chakras. 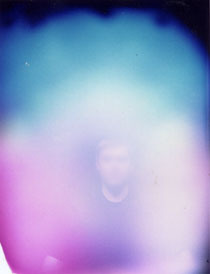 I have put the original photo of the human aura next to the painting and complete identity of color shades and their combination could be seen. Think this fact over, somewhere in the aura of the Planet work is being done and a person with a subtle feeling, in this case it is the artist takes to brush only the colors of the New Age. So a person approaches such picture and views it. Something gives a recall inside, excites him – it is impossible to leave. Everything vibrates around us, having its wave length and frequency, the paintings are no exception. The person, which stops by starts to resonate with the Energies, streaming from canvas, tunes to them and receives the Knowledge. Sometimes it is the Energy from outside that wakes up what might have rested for thousands of years inside the person, leading to the understanding of Planetary processes. Later on, if he heard some comments during the exhibition, he would take the book “Fire of the Unified Cosmos” and starting reading it, he will be surprised, where did the understanding of everything written there come from, only yesterday he couldn’t understand a thing. At such moments, an important element and help is the music, every picture Sounds. Jumping two months ahead, I’ll confide on the events. The period before the exhibition was rather difficult for those organizing it, and Valeriy Morugin hasn’t held a brush in his hand for a month. Which is like death for a creative person. It is the closing time of the exhibition – and the artist at last receives the impulse for creation. Over the telephone he says about his impression that someone teaches him how to hold a brush in his hand. And there the picture in a new un peculiar manner for the artist starts to appear. I realize that I must see this picture and probably even take it to Tuomen. So here we are in Kherson, in Morugin’s flat, where people sharing our views gathered because of our visit. Looking at the picture, one of those arrived exclaimed: “The picture sounds, I have heard the music!” And he describes the succession of the music sound, which was the same as in Tuomen in October 2006. Mainly there sounded the organ, but it was a pate tic sound, then the music of Vivaldi, Beethoven, Tchaikovsky and again the quiet organ music played till the end of the meeting. It was instantly decided – the picture goes to Tuomen. The people of Tuomen and Valeriy Morugin – are coauthors. Now the people of Tuomen gather in small groups to view the picture accompanied by music. And there they find color combinations and symbols, that one sees at the exhibition at the moment of self immersion. There appeared people, which took on the brush to spill their impressions on paper or silk after an encounter with this painting. Each time the center “Adamant” changes the form of presenting the information, providing opportunity for those who failed through individual session, seminar or by simply viewing the pictures. And then, even if 2-3 people, who have picked up the book, will not put it back and will search for answers on their own – this is victory.